Just as I started to blog about innovation and startups in Russia and Eastern Europe in September last year, a friend of mine shared a blood-chilling story about Ukrainian Internet entrepreneur Denis Oleinikov, her good friend. In essence, one of Oleinikov’s companies Prostoprint.com (online sales of custom-made Tshirts) has been raided by the Ukrainian police, his employees, including a pregnant woman put into jail for a few days, and freedom and livelihood of Oleinikov and his family were threatened. The Next Web covered the story, and Oleinikov wrote more on his Facebook page (use Google Translate Russian). He lives in the peaceful Croatia now. More on why later. 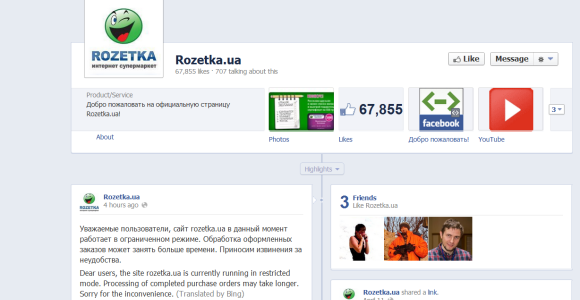 Today, Rozetka.ua was offline for a while. One of the leading Ukrainian ecommerce websites, which sells consumer electronics, has had troubles with tax authorities in 2011 so today its hosting company based in Ukraine Mirohost was raided, as tax authorities attempted to remove Rozetka.ua’s servers. You might say, they should pay their taxes then. The thing is, the company has been going to court against taxes claimed by the government, and in February this year it lost not only its case but also its appeal, as reported by Ukrainian blog ain.ua. Then, another of Oleinikov’s companies Imena.ru (which registers domain names, and a sister company of Mirohost) has been under the government’s attack. Thankfully, Rozetka executives acted swiftly and changed their hosting provider to a German one, continuing their business as usual under rozetka.com.ua. What will happen next we can only guess. Is Rozetka right or wrong in opposing the amount of VAT the tax authorities claim as rightfully theirs? We do not know. But as the Ukrainian Internet startup community begins to actively make steps in being known outside of their country, the current news are disheartening at the very least. This is probably why seed investors like HackFwd or Point Nine Capital do not go as far as Ukraine in their geographical coverage. Perhaps the uncertainty that comes from Ukrainian government is why Eastlabs accelerator is registering their startups anywhere but in Ukraine? But if you want to make your guesses, here is a brief summary from Oleinikov Facebook post (I doubt that Google Translate would do it justice). Oleinikov, after the dust settled down and he and his family have left the country, has figured out the reasons why he, the small business owner, has been targeted. Oleinikov was printing T-shirts, whatever clients order, he would execute and deliver. According to Ukrainian law, this is fair, even if the clients require copyrighted content to appear on the final product. I did not check the law, so I refer you to his original Facebook post. There were two reasons why he was targeted, according to that post. First of all, advisors to the current president Victor Yanukovich wanted to use such case of unfair prosecution of an SME to point finger at the unfair game of its opposition. So they ordered T-shirts criticizing Yanukovich, and then requested that Oleinikov stop producing them. When he refused, he was threatened with consequences. Secondly, a businessman with the right connections named Kolesnikov has secured an exclusive license with Warner Bros to be the only Ukrainian producers of merchandise with Euro 2012 logo. The approach to anyone else able to print such merchandise was simple: catch them on the spot producing the Euro 2012 products for a “third party”, threaten them with the jail and a complete loss of business, and negotiate freedom and peace of mind in exchange of production facilities. So whilst in the interest of the latter the purpose was to threaten, the other party in this story wanted to push to the end, to spill dirt on the political opposition. Oleinikov suffered the zeal of the latter, and fled the country secretly together with his wife and two children on the 20th of September 2011. He was officially accused of printing copyrighted T-shirts with Euro 2012 (an order of another interested party, apparently), but the media picked up the original “anti-government move” story. Rozetka.ua is under investigation, and knowing Oleinikov’s story I can only wonder about the real motives of the raid. Just as you are ponding whether or not Ukraine remains an attractive ecommerce market after this unsettling story, I can only say, that take any emerging market, and these are the risks one must consider, be aware of and hedge against.